Procurement of products manufactured with recycled materials. Overseeing the collection of recyclables by establishing recycling services contracts. The law encourages any state agency to purchase and use products made from post-consumer recycled materials when the product can be purchased at a price within 10% of the price of the same type of product manufactured from virgin materials, with particular emphasis on recycled oil, retread tires, compost, and recycled paper. 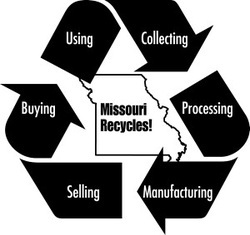 The Missouri Department of Corrections vocational training program offers products and services that meet “buy recycled” criteria. MVE products and services are only available to state agencies and other tax-supported entities. For link to their website and a full catalog of listings, click on the MVE logo. Recycling services include tires, toner cartridges, and office panel refurbishing. Recycled products include boxes, plastic bags, metal products, toilet paper, envelopes, furniture, clothing and more. Save time and money on hazardous waste disposal. See presentation as given by State Recycling Coordinator, Rob Didriksen. View the most recent Missouri State Government annual recycling report, which provides results of Missouri’s state government waste reduction and recycling efforts in fiscal year 2014. In 2014 the Missouri State Recycling Program efforts resulted in an estimated reduction of greenhouse gasses of 22,650 metric tons of carbon dioxide equivalent (MTCO2e). This is equivalent to taking 5,400 passenger vehicles off the road for one year! Revenues from the Missouri State Recycling Program are used to offset the cost of operating the statewide program. Surplus revenues are transferred to the Department of Social Services Heating Assistance Program, which provides heating cost assistance to low income Missourians. In 2014, $30,000 was transferred to the program, helping 150 households stay warm this winter. 5.9 billion Btu – enough energy to power 57 homes in Missouri for a year! For more information, see the 2014 Annual Report. Agencies that primarily serve the homeless. Agencies that provide assistance to the needy. Agencies that receive funds from the Older Americans Act. Surplus property is not available to the public.